Banff winter is a magical experience and something that should be on everyone’s bucket list. Even if you’ve never skied, like I hadn’t, it’s a place you cannot miss! I was recently invited to Banff by Fairmont Hotels and SkiBig3 to experience this winter wonderland for myself. I had visited once before, last July, but never during wintertime so I wasn’t sure what to expect. I had a feeling I would love it (who wouldn’t?!) but what I didn’t expect was to like it just as much, if not more, than during summer. I’m normally more of a sunshine and warm weather type of gal but this was a different type of wonderful. The roads were clear (I was pretty worried about the driving conditions), SkiBig3 and Fairmont Banff Springs made ski prep completely painless (they transport your gear from the rental center in town to the storage closet at the Fairmont for you), and I even learned to ski (much to the surprise of everyone who knows me)! Depending on where you are coming from, you will likely first want to fly into Calgary International Airport. Once at the airport there are two different options I recommend: (1) rent a car and drive to Banff or (2) take a shuttle. The drive from the airport is beautiful and around 90 minutes. As someone who does not like to drive in the snow, even as a passenger, I was relieved to find that the roads were almost completely bare everywhere we went while visiting. Because of this I would say that renting a car is the most convenient option because that way you can run around as you wish. Please note that before you enter the park you will need to purchase a Parks Pass. You can do this on your way in or in advance on the Banff and Lake Louise tourism site. Click here for pass price details and FAQs. If you do want to take a shuttle, they run regularly from the airport to Banff. Click here for more information on shuttle options. 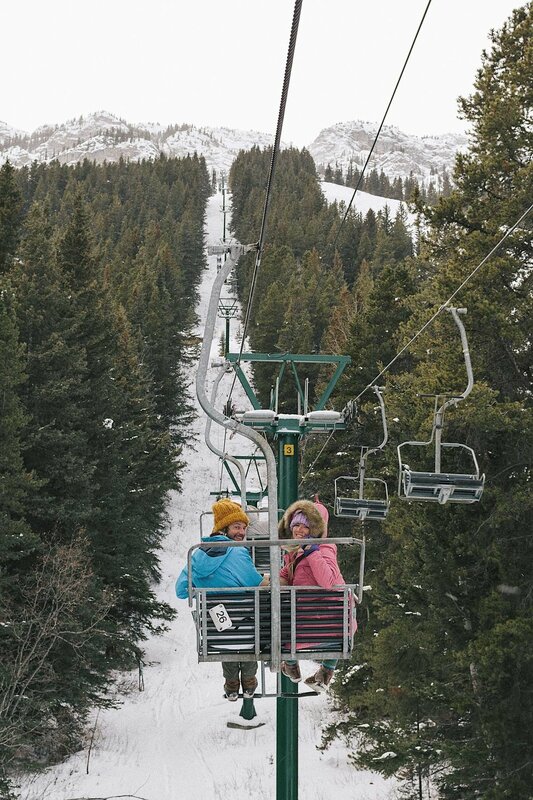 There are complimentary shuttles during ski season from most hotels to the three ski hills making it fairly easy to get around without your own car. LONG SLEEVE SHIRTS — When packing for snow, layering is KEY! Depending on the temp and the activity, I almost always would put a long sleeve shirt over a tank and underneath my coat. Grab a few HEATTECH long sleeve shirts. Click here for regular, here for extra warm, and here for ultra warm. The warmer you go, the thicker the material becomes. SWEATERS — I generally pack more coats and less sweaters since for the most part people will only be seeing your outer layer. There are two sweaters I always bring: click here for my favorite Canada Goose sweater and click here for my favorite Everlane sweater. The Canada Goose is a bit pricey but I promise it is SO amazing. FLANNELS/BUTTON DOWNS — I am ride or die for Rails button downs, buying new ones each year. They are very warm and an easy way to look a little more presentable than a plain old tee. I resort to these a lot on less adventurous days (strolling around town, shopping, etc.) as well as for dinners. Click here to see the latest prices. LEGGINGS — to wear under your snow pants! Or alone. Or under jeans. Layer, layer, layer. Click here for extra warm, here for ultra warm, and here for my all time favorite Alo leggings. I brought all three. CASHMERE WRAP — I always bring a cashmere scarf or wrap on all trips because I consider it an absolute essential. I actually carry one in my purse at all times. It is especially important during winter because, well, winter is cold! You never know when you’ll need an extra layer on a cold plane, train, or something else. Click here to see the latest prices. CARDIGAN — Barefoot Dreams’ circle cardigan is honestly one of the best travel purchases I have ever made. So warm and absolutely necessary. Also great for transit days and hotel lounging! Click here to see the latest prices. PARKAS — VERY important! I always pack at least two Canada Goose parkas. They are worth the splurge and have a lifetime warranty! Click here to see the latest prices. SOCKS — the warmer, the better! And bring a lot. I’ll never forget standing outside the Louvre at opening in early January and how truly freezing my feet felt. Click here to see the latest prices for my favorite socks from Amazon. SUNGLASSES — snow is very reflective so do not forget the sunglasses! Click here for my favorite Quay aviators (I have numerous pairs), click here for my round Ray-Bans, and click here for my all time favorite black on black Ray-Bans that are often hard to track down because they sell out consistently. HAND WARMERS — for your hands, your feet, and your phone in case it gets too cold! Click here to grab a value pack. For a full list of what to pack, click here for our snowy getaway winter packing list! The Fairmont Banff Springs is the place to stay when visiting Banff! They call it the “Castle in the Rockies” and it is just that - a picturesque castle centrally located in town. It is open year-round (since the 1970’s - before that it was closed during winter) and is especially beautiful in the winter when it’s surrounded by snow-capped trees. 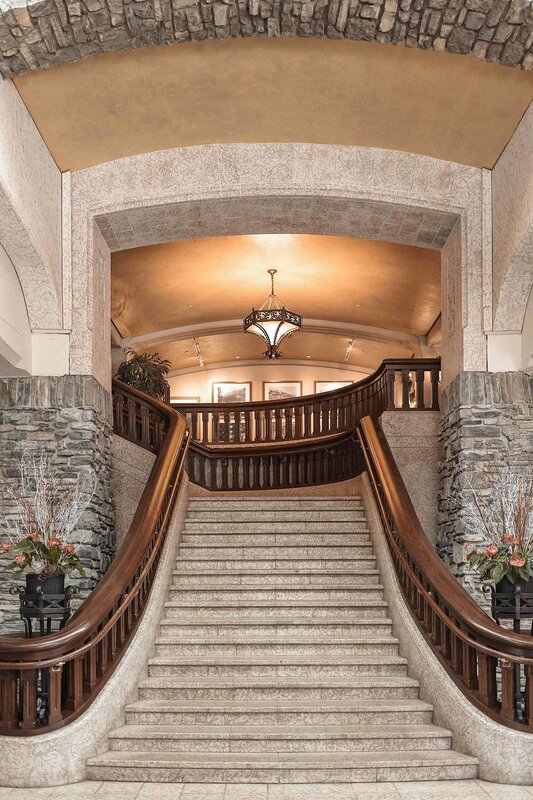 Fairmont Banff Springs has over 750 rooms and suites, many of which offer beautiful mountain views. The window view above is from my bed, believe it or not. Bringing a pet? They’re allowed too! One of my favorite things about Fairmont Banff Springs is the amount of fantastic dining options they have on-site. It’s great that the hotel is centrally located but it’s even better than you don’t need to leave at feeding time because some of the best Banff dining options are there! For breakfast I recommend the beautiful Vermillion Room where you can choose between the full breakfast buffet or a specific menu option. The restaurant is designed so magnificently that it was hard for us to stop snapping photos long enough to actually eat our meal! It is also open for lunch and dinner. If you are in a rush to get up to the mountains, as I was many mornings, head to STOCK Food & Drink attached to the lobby instead. It is full of delicious food and drink focused on fostering relationships with local farmers. I especially loved it because they had many fresh and healthy options. My favorite were the avocado toast (get it with an egg on top) and the green smoothie. Don’t forget your coffee! When you return from skiing in need of an afternoon snack, my recommendation is Grapes, Fairmont Banff Springs’ cozy wine and charcuterie bar. Get the chef’s medley board - the attention to detail they put into it is incredible. Last but not least, my favorite meal of the entire trip, their Waldhaus restaurant serving Bavarian cuisine! Despite being Bavarian I don’t normally love Bavarian food (don’t tell my relatives, please!) but Waldhaus was a different story. It is located in the woods above the Bow and Spray rivers, is incredibly adorable inside, and the food is delicious. I recommend the beer flight, kale and spinach caesar salad, haus made sausages, and chocolate fondue! Such a treat. Please note that while Waldhaus is a Fairmont Banff Springs restaurant, it is located separate from the main hotel. You can get it to either on foot or via Fairmont shuttle. It is unfortunately not wheelchair accessible. As if all of the above is not reason alone, Fairmont Banff Springs is also home to the marvelous Willow Springs Spa with 23 treatment rooms, 3 waterfall whirlpools, and even an outdoor whirlpool! It is the perfect spot to relax after a long day hiking in the sun or skiing in the cold. COMMUNITEA CAFE — this is actually located just outside the park in Canmore but if you have a car it is well worth the trek! It is a fresh and vibrant cafe with a menu full of local and organic ingredients. I visited more times than I can remember and everything I ordered was great. EARLS — I don’t normally like chain restaurants but Earls is another story. After trying an ahi bowl there this summer, we went back three different times. The winter menu is different but likely just as good! THE GRIZZLY HOUSE — a famous fondue restaurant. The entire atmosphere and experience is fun but service is quite slow so don’t plan on grabbing a quick bite here. SALTLIK BANFF — a “rare steakhouse” and another Banff staple. BANFF AVE BREWING CO — as I’m sure you can tell by the name, this is a brewery! Their beers are fresh, modern, and innovative, with something for everyone. 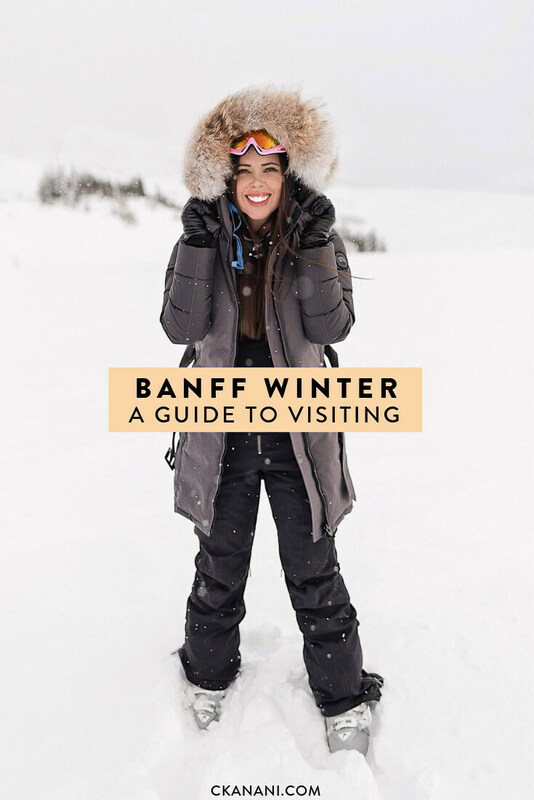 One of the most popular Banff winter activities is, of course, skiing! Banff is home to not one, not two, but three (!) world-class ski resorts: Banff Sunshine, Lake Louise, and Mt. Norquay. If you plan to visit all three Banff ski areas, and you should, the best way to do this is with SkiBig3. When you book with them you get access to all three resorts in one lift ticket. They also have some ski and stay packages available and gear rentals so you don’t need to worry about bringing your own equipment. It is by far the biggest bang for your buck! Click here for more information on SkibBig3. Never skied before? I hadn’t either. Not only had I never skied before but I was what I would call irrationally afraid of it. My mother was born and raised in Hawaii, never even saw snow until she was an adult, and (probably accidentally) raised us to be quite scared of it ourselves. While I love a good winter adventure, something about skiing was never of interest to me. When I found myself on this trip with SkiBig3 and a handful of other Instagrammers - some of whom are literally professionals - I knew it was time to give it a try. So while everyone else was hitting the slopes on their SkiBig3 guided adventure like the savvy skiers they are, I booked a private lesson with SkiBig3. After renting all of my gear from the SkiBig3 Adventure Hub in town the night prior, I met my guide Chloe at Lake Louise for a half day of one-on-one ski instruction. Since I had never skied before, Chloe started our session with the basics - how to carry your equipment (you should have seen me before I learned this, it was not pretty! ), how to put on your skis, take them off, and more. We practiced for a bit on almost flat terrain before eventually making our way up the famous magic carpet! Click here for more info on renting gear via SkiBig3 Adventure Hub. To my surprise it was much less scary than expected, thanks entirely to Chloe from SkiBig3. By the end of our half day I was going from the top of the learning area to the bottom without issue and even enjoying myself! She was so patient while also pushing me when she knew I was ready to advance onto the next thing. Not to mention she’s also just a lovely person - we had plenty in common and it felt more like I was hanging out with a friend than anything else. Overall I really cannot imagine learning to ski without this lesson. There were so many little details that a non-teacher wouldn’t think to mention but that were hugely important to me. Because of this I highly recommend booking a private lesson with SkiBig3! If you are traveling with friends or family of similar skiing ability, up to five of you can participate in one private group. Click here for more information on private lessons and to see the latest prices. If you’d rather take a group lesson, those are available via SkiBig3 as well. Whether you are a first-timer like me or you just want to improve your skills, there is something for everyone. Click here for more information on group lessons and to see the latest prices. If you are more advanced, blue-intermediate or above, you can do as the rest of the gang did and go on a guided adventure. More info on that can be found via the above link too. HUGE thanks to Chloe and the rest of the SkiBig3 team for the wonderful introduction to skiing! Tubing — Mt. Norquay is home to Alberta’s best tube park! Yet another SkiBig3 perk: tubing is included with your lift ticket. Après Ski — my favorite kind of skiing ;) While there are plenty of good options, my favorite was the Cliffhouse Bistro at Mt. Norquay. Accessed by riding the sightseeing chairlift up, this is by far one of the best views in Banff. Do not miss it. Ice Skate — Fairmont Chateau Lake Louise is home to what I would bet is the most scenic ice rink in the world. You can rent ice skates from them for two hours or a full day. You can also play hockey for free! Click here for more info. Dog Sled — another offering at the fabulous Fairmont Chateau Lake Louise. Click here for more info and for a full list of their fabulous winter adventure offerings! Soak in the Hot Springs — your SkiBig3 ticket comes with complimentary passes to the Banff Hot Springs. Visit the Willow Stream Spa at Fairmont Banff Springs — Click here for more info. This project was done in partnership with Fairmont Hotels, SkiBig3 and Travel Mindset. Opinions are my own, as always.